And I would shake my head and say, “no, I know what I need.” But obviously, I didn’t. I finally clued-in and his advice has now become my biggest packing secret, using a packing list! What a packing list does for you is to keep you organized when planning what to pack in your suitcase. Before your trip you can print out your packing list and be sure to add any special items to the list that are trip specific. Say you’re heading to the ocean, perhaps you need to pack your snorkel gear, so add that. Each section has a set of what I consider basic necessities for a vacation. Of course, if you’re taking a special type of vacation like camping, cruising, or a massive road trip, you might need to add some extras to your packing list. I’ve created two packing list options for you to use if you don’t want to start from scratch. If you want a simple, pretty packing list, you can use one my free printable packing lists that I have available for my subscribers. 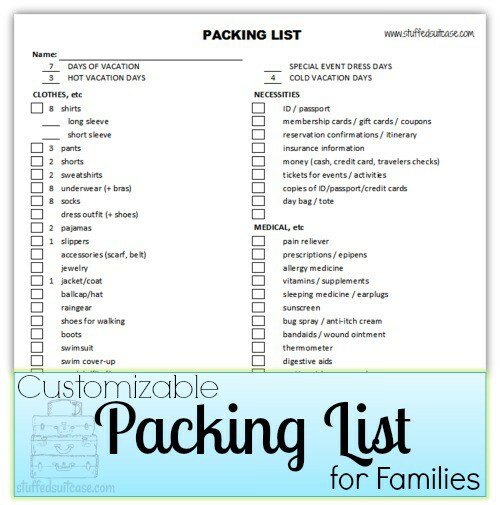 If you’re looking for a more customizable option, I shared a packing list excel spreadsheet that you can save a copy of and edit to create your own master packing list. My packing list excel sheet also has some calculations configured to help you know how many pieces of clothing to consider packing for your trip. Whatever type of packing list you prefer, the idea is to get used to using one! Now that I’m traveling more often for work, I’m so glad I finally listened to my husband and realized how using a packing list is the best packing tip secret. Hi there! Thanks for dropping in and commenting! :) Using a packing list has saved me so many times!! Heading over to check out your blog too!